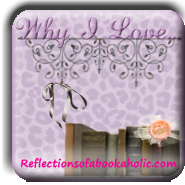 Why I Love...Your Favorite Summer Read!! Unfortunately I don't have any summer reads (which explains this week's topic), but I do love a great one. I love how summer reads make me feel like I've taken a grand vacation even though I haven't left home. If it's rainy outside, I can escape somewhere with a little sun. There is just something about a great summer read that makes me feel so relaxed and I seem to read them faster. So I'm definitely dying to catch up on some great ones!! Soooo... tell me your favorite summer read of this wonderful summer. Leave a comment or throw up a quick post. If you've already left a review this summer, go ahead and link up in the linky. It is nice to read of exotic locales during the summer isn't it? Winter reads should take you home. Summer reads should take you out. JuJu: What a lovely way to think. I don't have a summer read just now. I keep hoping I'm going to come across one that steals my heart away. Juju, you always say it best! I hadn't really thought about it like that. I like fluffy books in summer!! I was about to leave the same comment ! I also like to read contemporary during the summer because they aren't overly technical and can be easy reads. I read more contemporary books during the summer as well but I never really thought about why. Definitely love fluffy in the summer. So much better with the heat! oh man there have been so many good ones that I have read this summer. Divergent and Insurgent were great. One of my others was Okay for Now. I am actually doing a giveaway on this book too. I read Divergent last year and haven't gotten around to Insurgent yet. I took at look at your giveaway and added Okay for Now onto my list. Thanks! Have fun catching up on your reading. Books on a lazy summer day are so much fun. A nice romance, a humorous read! Books combined with the weather just makes me feel good. Summertime reading is the best! Sadly, I don't think I have one solid, go-to pick for Summer 2012. Several that I enjoyed, but nothing that I'd be willing to offer to you as one of this summer's best reads. Wow! Everyone is saying the same thing! Where are the summer reads?! I can't think offhand what my favorite summer read might have been but I do enjoy Elin Hilderbrand every summer. I just finished listening to A Discovery of Witches and Gone Girl and they were both excellent. Elin Hlderbrand... it doesn't ring a bell. I'm going to have to go take a look. And I'll go look for the audios at my elibrary. Thanks! I love summer reading in general! Yeah I do tend to read more beach theme books. I think so far my fav of the summer would have to be - Rainshadow Road by Lisa Kleypas. It was excellent! I love Lisa Kleypas! I'm going to go see if I can find it.